Before we talk about how to find resources, let's look at what kind of resources you're looking for. Books are a great way to do research. Most scholarly books are heavily researched and you can get an in-depth account of a topic in one place. Many times you can find books that cover all aspects of a topic from various lenses and perspectives. In addition, the references and bibliographies can help you to find specific research on your topic. For more information on scholarly sources, watch the videos below. This page also includes a chart to help you identify the difference between scholarly and popular articles. News articles are useful fro both historical research and for current event research. While these are not scholarly, peer-reviewed articles, news articles can give a good snapshot of a how an event was reported on and viewed at a particular time. Documentary films and videos can be a great source of scholarly information as they can share highly visual information that may be hard to express in written form. Websites can be also be a good place to find research. There are lots of areas where topics are being written about that aren't covered in traditional scholarly literature. Be wary of websites though. We will go in depth on how to spot a good source on a website from a bad one when we get to evaluating sources. Where do research articles come from? How do they end up in your search results? This video has the answers. 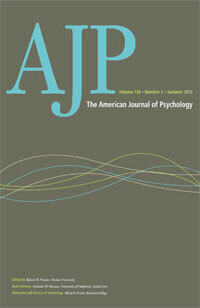 How do articles get peer reviewed? What role does peer review play in scholarly research and publication? This video will explain. When conducting research, scholars often rely on articles from scholarly journals rather than popular magazines. See the table below for a list of some differences that exist between these two types of resources. Many scholarly journals are "refereed journals" - they undergo a process called "peer-review" where other scholars in the field examine the articles before being published. Written by hired reporters, edited by magazine editors, and published. 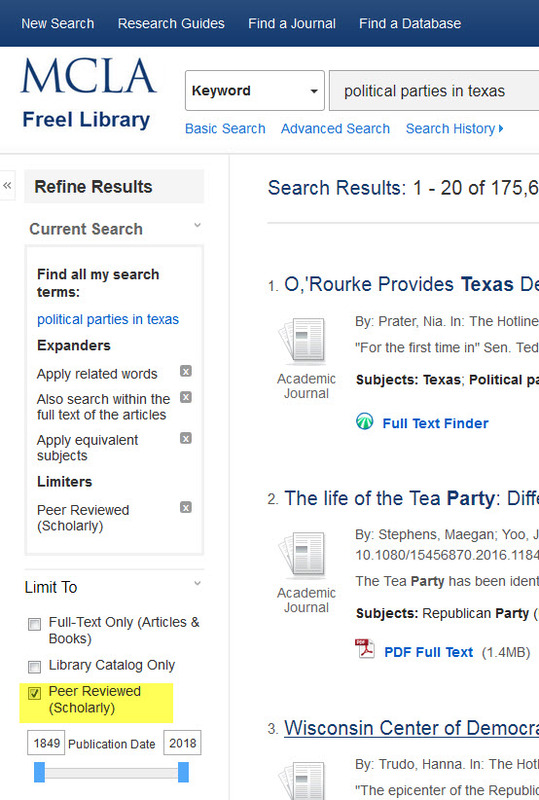 You can limit your search in the databases to only display search results that are scholarly, peer-reviewed articles. Below are examples. The JSTOR database contains only scholarly articles so there is no limiter in that database. 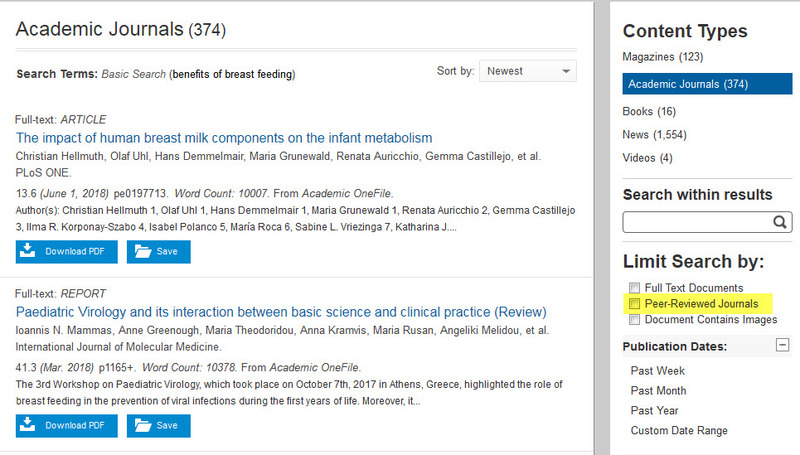 Gale - Choose "Peer-Reviewed Journals" on the right hand side.